Researchers in Manchester said they had identified the molecules on the skin linked to the smell and hope it could lead to early detection. The study was inspired by Joy Milne, a 68-year-old retired nurse from Perth. She first noticed the "musky" smell on her husband Les, who was years later diagnosed with Parkinson's disease. Joy, who has worked with the University of Manchester on the research for three years, has been named in a paper being published in the journal ACS Central Science. She has also been made an honorary lecturer at the university because of her efforts to help identify the telltale smell. The research revealed that a number of compounds, particularly hippuric acid, eicosane, and octadecanal, were found in higher than usual concentrations on the skin of Parkinson's patients. They are contained in sebum - the oily secretion that coats everybody's skin, but which is often produced in greater quantity by people with Parkinson's, making them more likely to develop a skin complaint called seborrheic dermatitis. 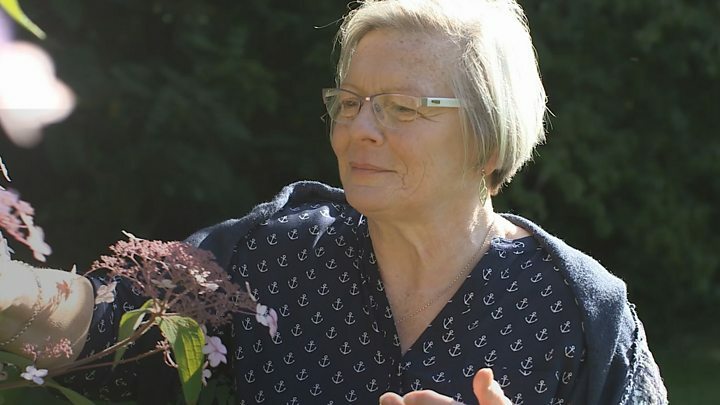 Lead author Prof Perdita Barran, from the school of chemistry at the University of Manchester, told BBC Scotland: "What we found are some compounds that are more present in people who have got Parkinson's disease and the reason we've discovered them is because Joy Milne could smell a difference. "She could smell people who've got Parkinson's disease. "So we designed some experiments to mimic what Joy does, to use a mass spectrometer to do what Joy can do when she smells these things on people with Parkinson's." One in 500 people in the UK has Parkinson's and that rises to about one in 100 among the over-60s. It can leave them struggling to walk, speak and sleep. Currently there is no cure and no definitive test for the disease, with clinicians diagnosing patients by observing symptoms. Prof Barran said she hoped the "volatile biomarkers" they identified could lead to a simple early detection test for the disease, such as wiping a person's neck with a swab and testing for the signature molecules. She said: "What we might hope is if we can diagnose people earlier, before the motor symptoms come in, that there will be treatments that can prevent the disease spreading. So that's really the ultimate ambition." Joy's husband Les, who died in 2015, was told he had Parkinson's at the age of 45 but Joy said she detected the unusual musky smell about a decade earlier. The retired nurse only linked the odour to the disease after meeting people with the same distinctive smell at a Parkinson's UK support group. She told BBC Scotland that not knowing Les had Parkinson's put her family in a "negative spiral". "It would have changed things dramatically. "The fact that he became withdrawn, reserved, he had bouts of depression and mood swings, if I had understood what was happening it would have changed our total outlook on life."